The Marine Corps of China’s PLA Navy (PLAN) held their first-ever field drills in the Gobi Desert, in Xinjiang province, late last week, China Military Online reports. A battalion of marines, armored vehicles, and artillery units took part in a “confrontation exercise” and a counterterrorism drill from January 22 to 23. 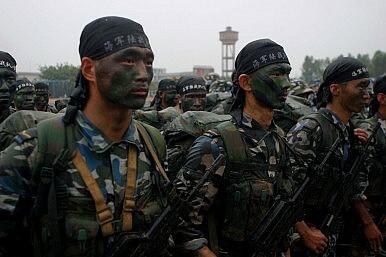 The confrontation exercise pitched a mock battle between the marines and “a reinforced infantry company of the PLA Army,” according to China Military Online. The marines won the day thanks to “better mobility and stronger firepower,” China Daily reported, citing the Navy’s statement. Tellingly, the counterterrorism drill was a hostage rescue exercise, where the marines practiced reconnaissance, breaching a terrorist position, and evacuating from the area. There’s a special poignancy to that exercise, as a Chinese citizen was executed by the Islamic State last November. The victim, Fan Jinghui, was held hostage for months prior to being murdered, with Islamic State publicly soliciting an unspecified ransom for him. Yet what the foreign ministry described as China’s “all-out efforts to rescue him” were ultimately unsuccessful. A few days later, three more Chinese citizens died in a hostage situation in a hotel in Bamako, Mali, once again driving home the need for China to build up the capability to defend its citizens abroad – by force, if necessary. I’ve written before that China has no interest in committing to an all-out military assault on terrorist groups overseas, such as the American or Russian air strikes against the Islamic State. However, conducting small-scale raids abroad to defend Chinese citizens or interests are not out of the question, particularly if Beijing can secure cooperation from the other government involved. In fact, China’s new counter-terrorism law provides a legal framework for Chinese troops to take part in counter-terrorism operations overseas. The rear admiral who oversaw the drills said the exercises “enabled us to improve the marines’ long- range operational capabilities” – a must if China is ever going to deploy its elite forces overseas. According to a statement from the PLAN, it was the farthest the Marines have ever traveled for an operation; all told, the battalion of marines involved in the exercise traveled nearly 6,000 kilometers from their base in Guangdong to reach the exercise site. Admiral Wu Shengli, China’s navy chief, was on hand to inspect the event, and commented that the marines must be trained to operate in various geographic regions. But don’t let the “desert” aspect give you the wrong idea – this was still winter training for the marines. Low temperatures in that region of the Gobi hovered around -15 degrees Celsius last week.